Rangers manager Ally McCoist thinks the Ibrox club are on the road to recovery, but has warned fans to be patient. He was speaking as the Third Division club announced plans to float on the AIM market of the London Stock Exchange in the hope of raising up to £20m. 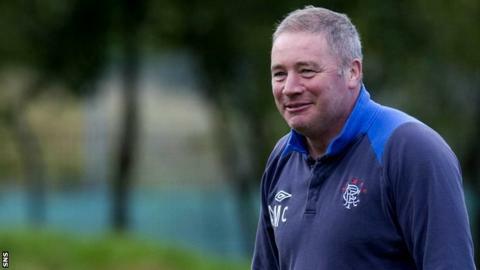 "I'm excited because this has been the most dramatic six months for the club and its support," said McCoist. "I don't believe for a minute that we're out of the woods yet, but there is light at the end of the tunnel." Rangers aim to raise the extra revenue through an institutional investor placing and limited public offering. Financial director Brian Stockbridge insisted that the Ibrox club can continue without the projected £20m but stressed that the money would bring their plans forward. I'm very confident that we'll get back to where we were. The club say the funds are to strengthen the squad, improve and develop their properties and facilities and provide additional working capital. However, Rangers are currently restricted by a transfer embargo that runs until 1 September 2013. "I'm really, really excited by the prospect of the club getting back to where it was," continued McCoist. "It's not going to be an overnight fix. We have to take a real, hard look at where we are and what's actually happened. "I don't think the vast majority of our support know exactly what's happened to the club. We've lost 28 players in six months. "We're not going to get back to where we were overnight, there has to be a realistic approach to it. "At least now we can see where we want to go and there's a path to it. "I'm very confident that we'll get back to where we were. In fact, I'm really looking forward to the challenge." Chief executive Charles Green revealed the club will be undertaking an institutional investor roadshow, claiming that to date there has been "strong interest". "From the time we acquired the business and assets of Rangers FC, we indicated our intention to list the company and provide our fans with the opportunity to invest in their club. I am delighted that our plans are coming to fruition," Green said. "Our aim is to return the club to its glory days whilst ensuring it is run efficiently and profitably." "Historically when a club has floated it hasn't been very good, but we've got the ability to generate huge revenues from merchandise," he said. "We're at the late stage over a kit deal with adidas or Puma and the moment we were knocked out of the SPL we took control of our image rights. And we have no debt. "There is a real business there, but unfortunately it's a business that's been run badly in the past." Meanwhile, Rangers say they have agreed "an undisclosed settlement and financial arrangements" with Sheffield Wednesday following Rhys McCabe's move to Hillsborough. Former Ibrox youth player McCabe objected to having his contract transferred when Rangers were re-formed by Green's consortium and the midfielder subsequently joined Wednesday. "Sheffield Wednesday have acted in good faith and recognised our rights as a club during the process," Green told the Rangers website.